XperiFirm Tool makes the tedious task of manually searching and downloading stock Sony Xperia firmware easy. Xperifirm downloads Sony firmware from official servers and there is no chance of firmware being corrupted. 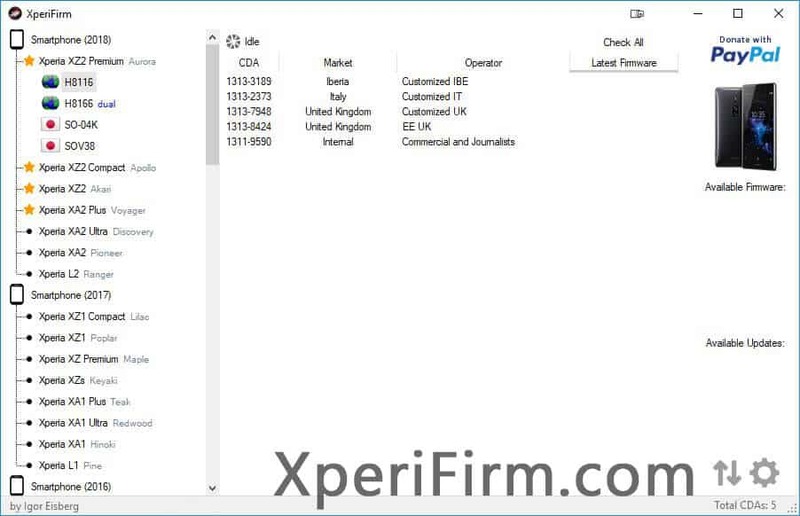 Here on this page, you can download Xperifirm v4.5.0 for Windows 10/7/8/8.1, Linux and Mac. ATTENTION: You must update to this version, else the device list might not load. ATTENTION: This update is the re-release of 4.5 with various critical fixes! XperiFirm moves to X.X.X version format ([Generation]. [Major Update]. [Minor Update]. FIX: The bug that caused "Invalid resource file received!" on some computers was fixed. FIX: Several other bug fixes and code improvements. NEW: Proxy settings added! Click the new gear icon next to the "Check All" button. NEW: All country flags in the device list are now being loaded from XperiFirm's server, which means if new flags are needed, you won't need to download another version of XperiFirm, it's all being covered server-side! NEW: The panels aren't being locked anymore when using the "Check All" button. You can scroll the lists, click on the CDAs as they are being checked and resort the list. This will not interrupt the checking process. FIX: Some visual bugs were fixed for even smoother experience! Below you can download Xperifirm v4.5.0 for Windows, Linux and Mac. To use it on Linux and Mac, install Mono on your system (instructions provided below). [*] Always Scan First: We have scanned XperiFirm_4.5.0_(by_Igor_Eisberg).zip before sharing it here. However, we still recommend you to scan the file before using.